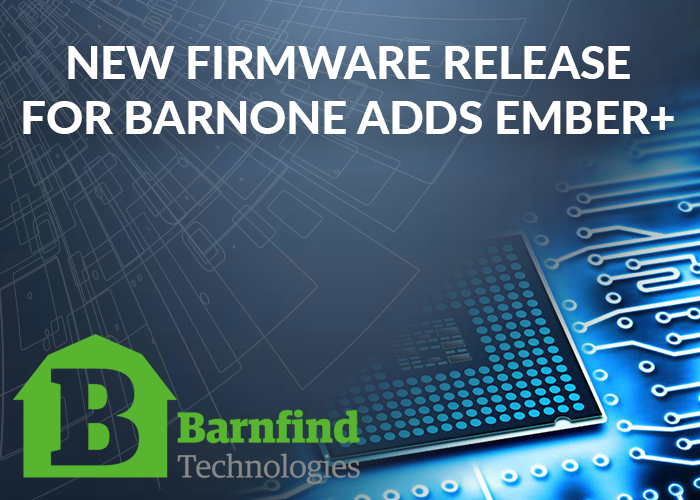 Just before the year ends, Barnfind announces a new firmware release for BarnOne units. Besides some smaller fixes this update adds the support for Ember+ control protocol to BarnOne. The implementation of Ember+ eases the seamless integration into installations with comprehensive control systems such as KSC, VSM, Cerebrum, hi-app and many more. Ember+ exposes the entire functionality which is housed inside a BarnOne unit to 3rd party control systems. The presently implemented Pro-Bel protocol SW-P-08 offers functions like cross point switching and exchange of port labeling, with Ember+ as control protocol SFP DDM (Digital Diagnostic Monitoring) data and even SFP control is displayed and external control enabled. Now you are able to activate the color bar generator inside an emSFP (Embrionix) from your control panel, or turn off the optical output of a SFP with a certain wavelength for e.g. troubleshooting. It further opens doors for tie line management or other advanced control features which are not available in Barnfind’s (free of charge) control software client BarnStudio.